Rigidity of the telescope structure. Resistance of the rocker box to humidity. Softness and precision pointing the telescope. All pieces will be built locally except the mirrors, the focuser and the red dot finder. Some of the designs and pictures shown on this section are copyright protected, please ask if you need to reproduce. 2.- Rigidity of the telescope structure. High quality plywood and aluminium will confer an exceptional rigidity to the telescope. We want the mirrors alignment to be kept when moving the telescope from zenith to horizon. 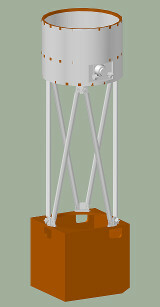 Six strong cylindrical tube legs 30x27mm will hold up the secondary mirror and focuser minimizing the tipical loss of alignment when changing the altitude of the telescope. 3.- Precision of optical alignment. Isostatic positioners is the motto here. 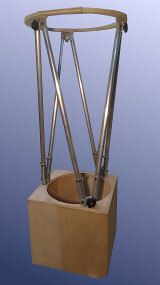 Each couple of legs from the upper part of the telescope containing the secondary mirror are joined to the rocker box by 3 brass supports. The plane containing the 3 supports forms a triangle with no possible movement when changing the direction of the telescope. 4.- Resistance of the rocker box to humidity. Unlike similar telescope from Skywatcher and Meade our telescope bottom box will be made of water resistant plywood (unlike particle bloard being used by Skywatcher and Meade). 5.- Softness and precision pointing the telescope. The vertical axis of rotation of dobsonian telescopes often produces unwanted movements and jerky rotation. Our telescope will solve this rotation with a innovative solution. Nine roller ball bearing units each one having a capacity of 15 kg will unsure a soft and precise rotation. Dobsonian telescopes are optimized for observation. For that the secondary mirror is as small as possible to reduce the shadow it projects on the main mirror. But this has a drawback as the focal plane is too close to the upper cylinder englobing the light path. If we want the camera ship to coincide with the focal plane, the camera will be on the path of the light and will produce shadow on the main mirror. On newtonian telescopes for astrophotography, the secondary mirror is slightly bigger and closer to the main mirror. In the case of the telescope being built at astroGC, we want both a small secondary mirror and photography ability. 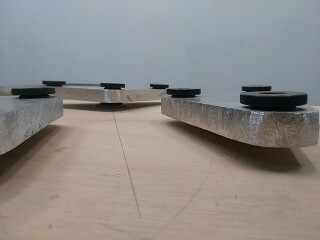 For that, the legs supporting the secondary mirror will be adjustable in length. We have chosen a BK7 glass as substrate for the main mirror because of its high homogeneity. The surface of the parabolic mirror is diffraction limited. The reflectivity will be of 94% quartz overcoated. Its diameter will be of 405mm an focal lenght 1800mm (ratio f/4.5). The mirror thickness will be of 45.3mm. The upper cylinder protecting the secondary mirror from any disturbing light source (like the moon) will be about 50% bigger that usual telescopes from Meade and Skywatcher. Four legs supports of secondary mirrors produce disturbing flares around the stars. We will be using 3 legs supports at 120º and this will remove flares. The mirror cell has been calculated using the computer program PLOP. A 9 points support has been selected, with a steel sling for better behaviour at low altitude. The results from PLOP show excellent RMS and P-V error. Steel band supporting the mirror. Once the telescope is finished, we collimated it for the first time. This operation resulted to be very easy and precise. The mirror supports work fantastic! Then we went on with the first tests. The first test in conditions (in the mountains, with low light pollution) has been carried out on 27 July 2018. It was precisely the night of the longer eclipse of this century. The results were excellent and the telescope works pretty good. The legs system worked good and the telescope remained collimated after mounting and unmounting a few times. 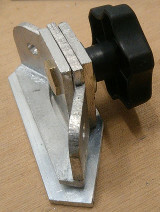 Nevertheless we detected the aluminium welding of the legs supports are not reliable and may break at any time. This is not compatible with the long excursions we organise in the mountains at astroGC. Thus we decided the legs and their supports should be redone. With the new system it will take more time to mount the telescope but will be much more robust.